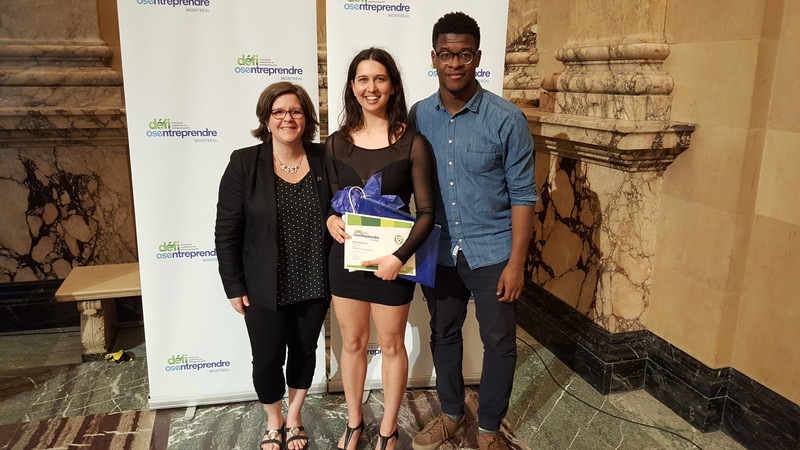 May 3, 2017: It was exciting to sit next to Liberal Arts student Sandrine Carle-Landry when the winner for the regional OSEntreprendre Challenge was announced in the individual and small team category. Her submission and entrepreneurial project was recognized over submissions from all Cégeps on the island of Montreal. I was seated with her friend Corinne Pelletier who was one of the subjects in a series of videos produced for Sandrine’s project, Refus global now and, Kim Simard who coordinates the Women Studies Certificate. We were thrilled to witness how eloquent her presentation to the crowd at City Hall was when she collected her prize of 800$. Sandrine’s entrepreneurial project is an independent media and a pro-inter-sectional production box. Through the use of social media, the goal of Refus global now is to create media content that promotes the convergence of various social struggles and highlights causes usually ignored by traditional media. One of her videos, Parlons poils: LA PILOSITÉ FÉMININE was viewed over 345,000 times in a very short period of time !!! You can view the video by clicking on this link. President and DG, Manon Théberge; Liberal Arts student and Women Studies Certificate Sandrine Landry; Contest Spokesman, Fabrice Vil who is also the Co-Founder and Executive Director at Pour 3 Points and Columnist at Le Devoir. The OSEntreprenedre Challenge recognizes students who demonstrated an entrepreneurial spirit by acting on an idea and bringing it to life. Student-initiated projects were evaluated on impact, scope, originality and innovation as well as the student’s capacity to mobilize resources and take the project from start to finish. Sandrine will now compete at the national level with other regional finalists. Wish her luck on June 14th when the National winners will be announced in Québec City and, let’s get those views up to a million!!! May 4, 2015 – It is with great pleasure that the Dawson College Centre for Innovation & Entrepreneurship announces a win for our students at the Quebec Entrepreneurship Contest! 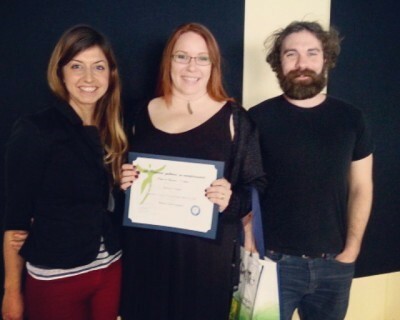 This is the 2nd year in a row Dawson students have been honoured with a prize. Eweek’s Dawson Den finalist Meghan Dove Designs represented the college as the winner of a $2000 grant from Desjardins. Meghan was chosen for her educational social network project ‘Ped Day’, an application for schools that combines the best of Facebook groups, LinkedIn and Omnivox, and is intended to unite and improve the education experience of students across programs, schools, the country and around the world. Meghan is a graphic design student at Dawson and stood out to the jurors among the 10 000 participants from across the province. The CIEE would also like to recognize the great work of runner up projects Charity Hoppers and Dream Day Services who helped to represent Dawson as a leader in supporting entrepreneurs. April 2014 – You may recognize her as the third place winner of Dawson’s Den during EWeek 2013. Annouchka Tchiniaev not only pitched her idea during EWeek but also made it happen. In fact, she also entered in the Concours Québecois en entrepreneuriat and won again!!! 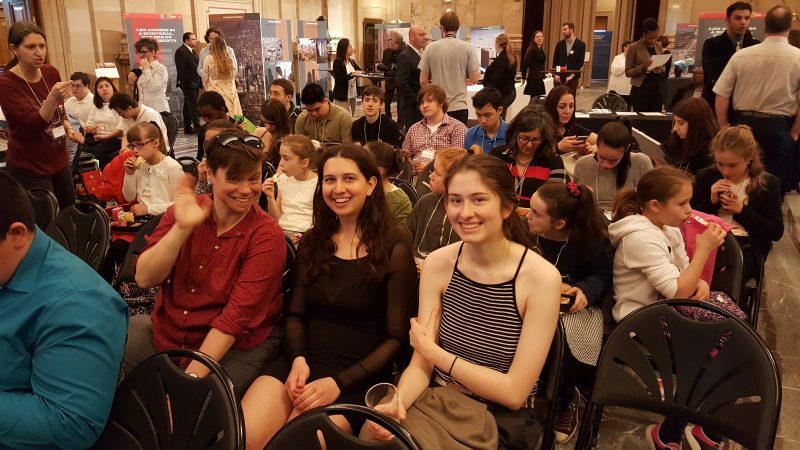 Annouchka Tchiniaev (left) and her VP Serena Drescher are seen here at the Concours Québecois en entrepreneuriat finalist ceremony at City Hall. Leucan won a prize of 500$ and will now move on to the provincial finals on Jun 18th, 2013. 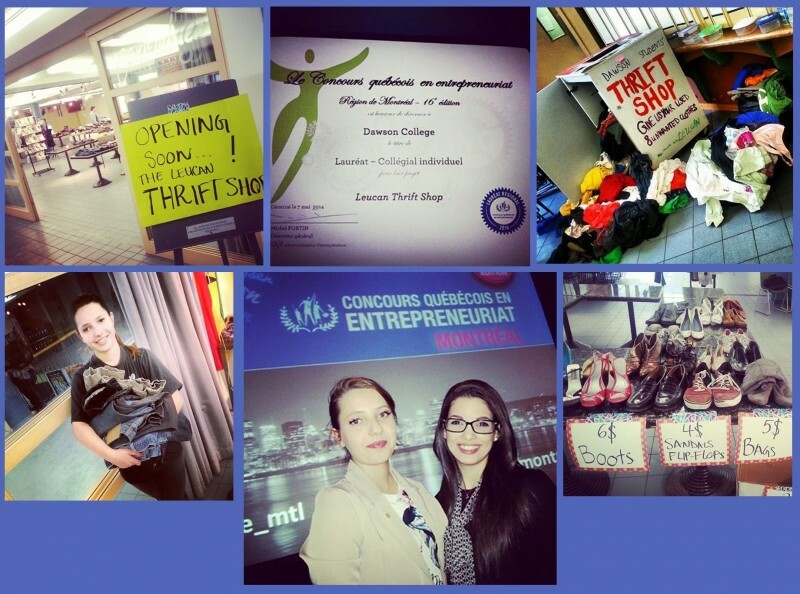 Leucan thrift shop was created for Dawson College students who cannot afford to pay market prices for clothes. All the thrift shop proceeds go to Leucan, an organization contributes to cancer research and that provides help to children suffering from cancer. Right after the awards ceremony, Annouchka got busy putting the final touches on a talent show, the proceeds of which will also go to the Leucan organization. A true entrepreneurial spirit and a wonderful human being, Annouchka is sure to make the world a better place.